NH Legal Perspective: What is a patent for? Truisms like these are rarely questioned. Anybody who has ever invented the NEXT BIG THING has invariably been advised to patent their invention. If you are an inventor, this is constantly reinforced, for example, by your friends, your neighbors, ALL of your relatives, and in just about every episode of Shark Tank. So you, like everyone else, have been programmed to believe that inventions must be patented. But is it true that inventions must be patented? Why do you need to patent your invention? Myth #1: You need a patent in order to commercialize your invention. Reality: You can commercialize your invention with or without a patent. Myth #2: You need a patent to keep from being sued by another inventor. Reality: Even if you have a strong, valid patent, you may still be successfully sued by another patent holder if, by practicing your invention, you are infringing his patent. For example, if you patent a pencil with an attached eraser, you can still be sued by the patent holder of the pencil. Myth #3: You need a patent to keep others from stealing your invention. Reality: Well, perhaps this one should not be called a myth, as it is merely incomplete. While a patent doesn’t automatically keep others from stealing your idea, a patent does give you a path to seek recourse from a third party making, using, selling, or importing your invention. And here we arrive at the primary reason to get a patent. A patent is a license to sue. Not as exciting as 007’s license to kill, but it has teeth. If you have an issued, non-expired U.S. patent, the United States government recognizes your right to file a civil lawsuit to stop a third party from “infringing” (making, using, selling or importing) your patented invention in the U.S., and to seek damages for their having done so. This is hugely important. It means that an inventor has the means to protect their investment of time, money, material and effort expended in developing the invention. This also explains the government’s interest in patents, because advancement of technology is the engine that drives the economy. If inventors were unable to protect their inventions, how many would invest the time and resources to develop them? The government is also interested in the proliferation of technology, which is why patent protection is limited to a 20-year time window: Thereafter anyone can practice the invention. So patents serve the needs of both inventors and society as a whole: Patents give inventors a right to protect their inventions, and patents provide a path for new technologies to enter the public domain. The question of “must I patent my invention” stands apart from the question of “should I patent my invention.” There are many important reasons to patent your invention. For example, you will need a patent if you ever want to sell or license the rights to your invention. After all, if you can’t stop anyone from practicing your invention, why would someone pay you for the right to practice your invention? However, in certain circumstances there may be compelling reasons not to patent your invention. An inventor should carefully consider whether or not to seek a patent, knowing that there is a choice. 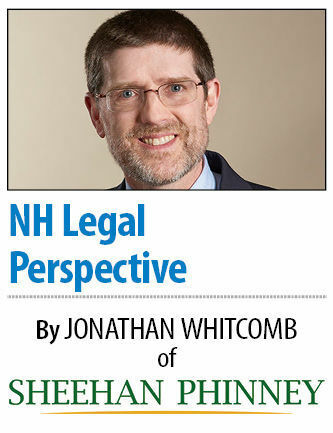 Jonathan Whitcomb is an intellectual property attorney for Sheehan Phinney Bass & Green PA.
NH Legal Perspective is sponsored by Sheehan Phinney Bass + Green PA. This column does not provide legal advice. We recommend that you consult an attorney for specific guidance on legal questions.